3rd Generation Family Owned with 50 Years' Experience! Dan’s Welding & Fabricating Ltd. has provided welding and custom fabrication services in Burlington since 1960. We work with a wide variety of metals including steel, stainless steel, aluminum, checker plate, expanded metal, tubing, bar, cast iron, tool steel and more. A locally-owned and operated company, we are CWB-certified and are very skilled in MIG, TIG, and Stick welding. In our 18,000-square-foot shop we have a wide variety of equipment with the capabilities to do metal shearing, rolling, bending, punching, drilling and machining. Due to being completely custom, Dan's Welding and Fabricating Ltd. has serviced a wide variety of industries including material handling, construction, food industry, and all types of manufacturing companies. The variety of work is exciting, and all the ideas come from you. Being Canadian Welding Bureau Approved is not only an opportunity to meet the requirements of the standards but to document our welding procedures, verify and improve the skills of our welding personnel, improve quality and productivity and to meet and exceed your expectations. Call Dan's Welding and Fabricating Ltd. today for all your custom welding and fabrication needs in Burlington and Hamilton. We proudly serve Burlington, Hamilton and the surrounding areas of Southern Ontario. You provide the hand sketch, the CAD drawing, etc… and we will bring it to life. With more than 50 years’ experience, we can assist you with your plan, and when required, we will hire an engineer. Family owned and operated since 1960, we have 24 employees – 8 of them with more than 20 years’ loyalty. Together, that is a ton of knowledge and experience to get your job done the way you want it. 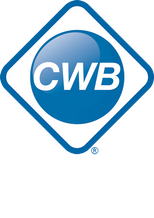 Canadian Welding Bureau approved, certified to CSA standard W47.1, in division 3 (certification for fabrication of structural and miscellaneous steel) you can trust our work.